If I have to choose my most dreaded subject back in school days, that would be easy. I was more of a Chinese and Maths student and that was evident, as well as consistent, from primary school all the way till university. So although I did not particularly embrace English, it didn't come close to my most feared subject of all - Science. Bearing that in mind, I have been trying to get Angel to be more curious about how the world works, about why things happen the way they do, about why there are actions and reactions - all in the hope of arousing her interest in Science and not letting my own fear of the subject pass on to her in any sense. 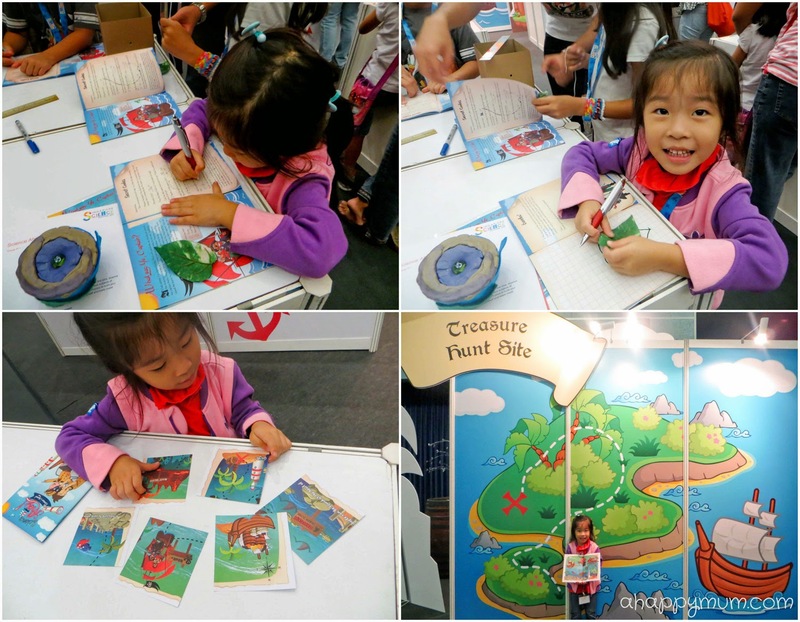 Over the weekend, we had a perfect opportunity to do that at Science Ahoy! which was held at the Science Centre Singapore. If you remember how we used to be Young Scientists when we were kids and went around collecting stamps and badges, well, this is similar except decades have past, wrinkles have formed, and it's now time for our little ones to play the part of the enthusiastic scientist instead. 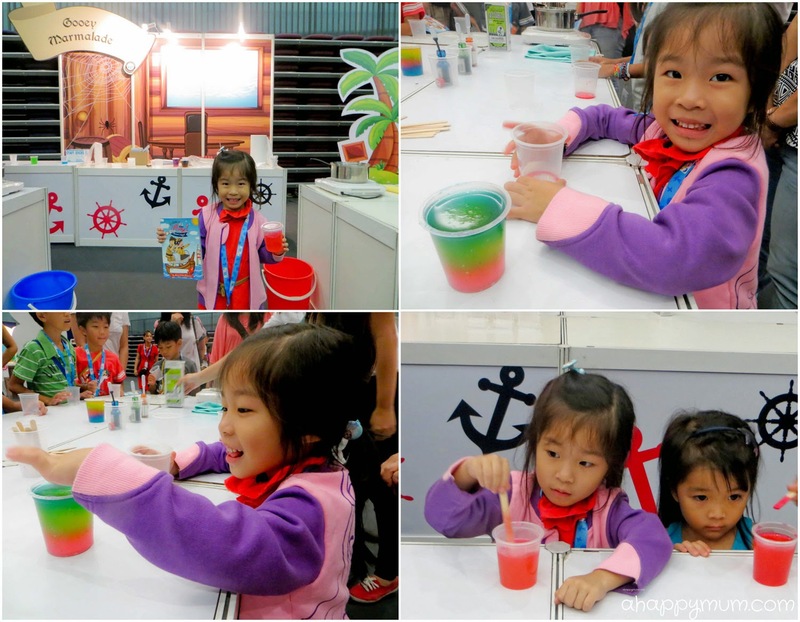 As part of the Singapore Science Festival 2014, Science Ahoy! is being held for the first time where kids get to learn about Physics, Chemistry and Mathematics through a series of fun experiments and activities. Although it is targeted at primary school students, if you have a curious preschooler who is keen to try, I think this would be a great opportunity for you to come together as parent and child. For me, while trying to simplify some concepts in layman's terms for my big girl, we had fun bonding and learning new things together. Here are the four stations we tried out that day. We made a boat out of cardboard, learnt about water tension and how to propel a boat using just a drop of soap. Next, we were also taught buoyancy and how a bigger surface area will enable a piece of plasticine to stay afloat. All kids like jelly, right? Ok, at least mine do. In this station, kids get to make a gooey jelly-like substance using just food colouring and psyllium husk - a natural source of soluble fiber, and they get to take it home too! This is definitely Angel's favourite station of all - likely because she got to be crafty! 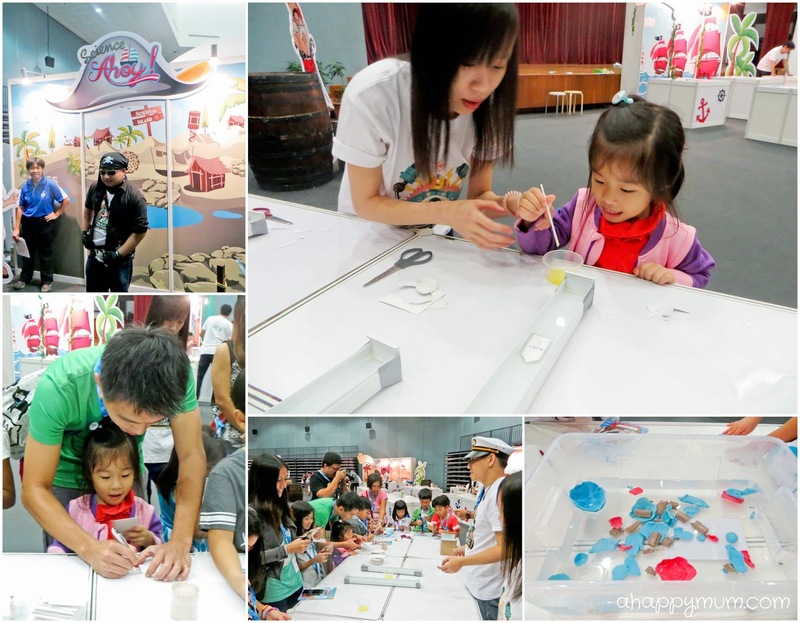 Kids get to learn about the different layers of the Earth, why earthquakes occur, as well as use plasticine, marble, scrap paper and plastic bowls to make their own model of the Earth as a keepsake. 4) What Say Ye, Sailors? In this last station, the kids were each given a leaf and tasked to find its perimeter and area. By using a piece of string and counting the number of squares on a paper, they learnt about creative ways to measure irregular shapes and also encrypt messages. Upon completing every station, they will also receive a part of a treasure map and once the puzzle is solved, every kid will get to receive a 'treasure'. At end of the day, it's not about getting the treasure, it's about the process of finding it, right? Science Ahoy! 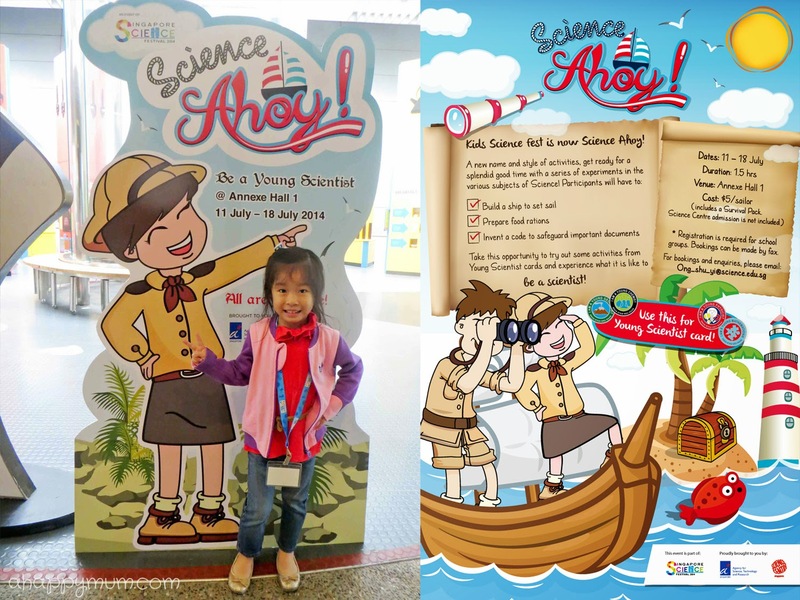 happens from now till 18 July at Science Centre Singapore, Annexe Hall 1. It takes approximately 1.5 hours to complete and fees are at $5 per participant, not inclusive of Science Centre admission. For more details, go here. I think my girl was absolutely thrilled to be a young scientist for a day! Will your kid be too? Oh wait, that is not all we did in a day at the Science Centre. 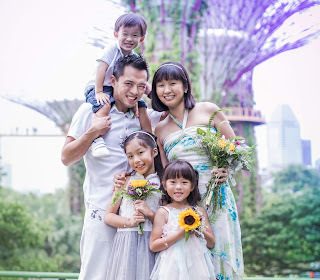 Here are some other fun and family-friendly activities you can consider too! 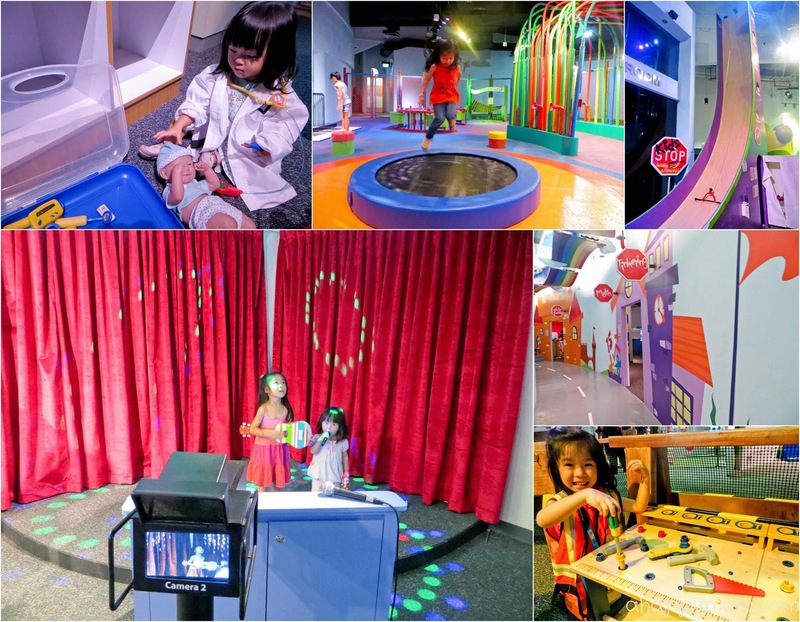 This unique larger-than-life 3D interactive exhibit allows a multi-sensory journey through the human anatomy for visitors to learn about the workings of the circulatory, digestive, immune, nervous and respiratory systems. 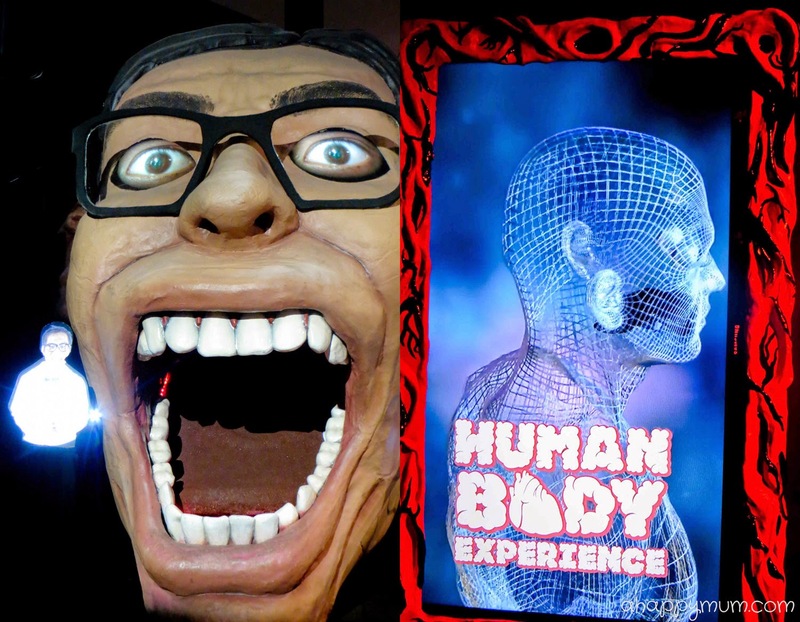 You will enter through the mouth of a 6-metre tall human face and pass through a twisting maze of tunnels through the throat and stomach. It might sound bizarre but we actually loved sliding down the throat, crawling through the arteries, bouncing in the stomach, getting sprayed by 'acid', feeling the air in the lungs and squeezing through intestines. 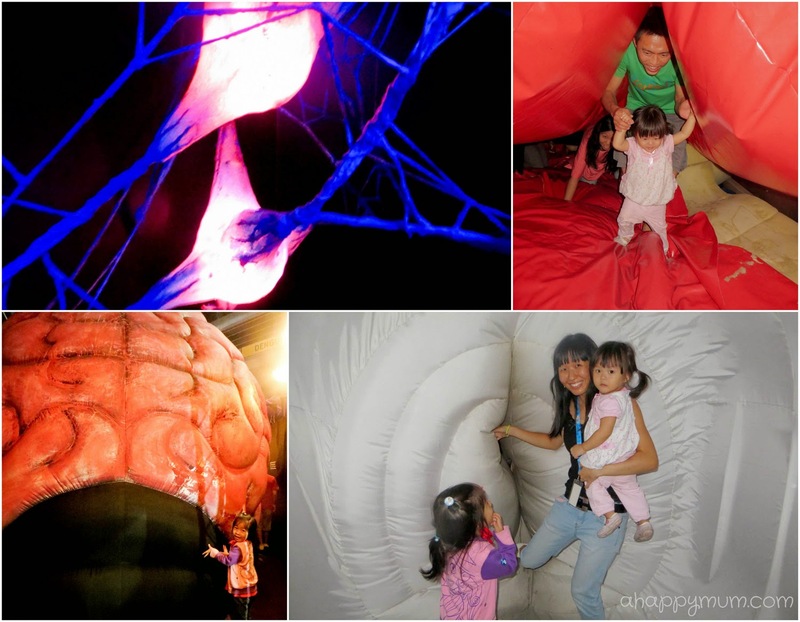 I would say it was definitely the most fun and innovative way for families to come together and learn about the amazing functions of the human body. HBX exhibition runs from now till 31 May 2016 at Science Centre Singapore, Hall B. 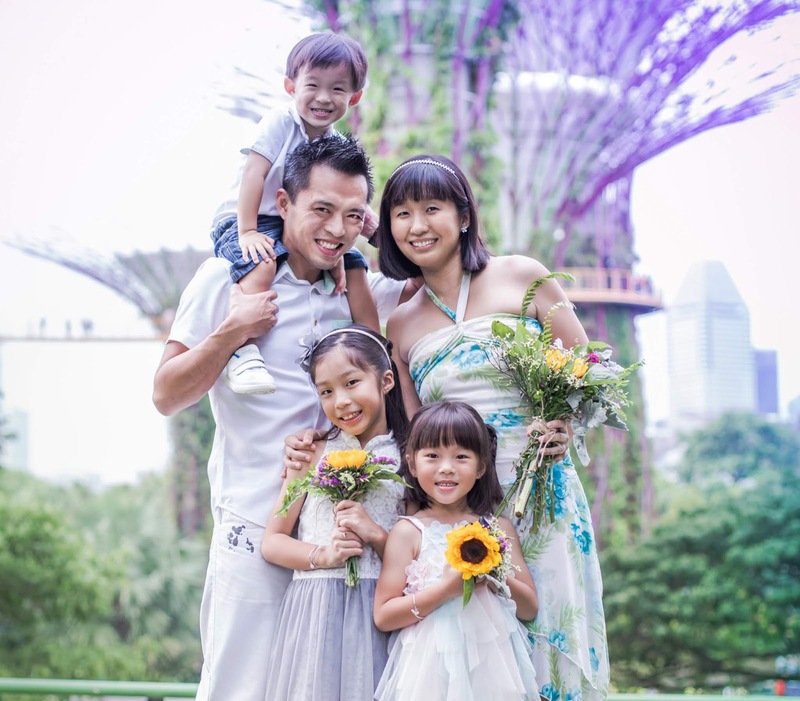 Tickets are priced at S$20 per adult and S$15 per child, inclusive of admission to Science Centre. For more information, go here. Note: Visitors are advised to come in something comfortable and required to have a basic level of physical flexibility and balance. The attraction contains enclosed spaces, strobe lighting and special effects that might be uncomfortable for some and are recommended for children above five. But just so you know, Ariel enjoyed every part of the journey too because it was not an exhibit but a theme park to her! 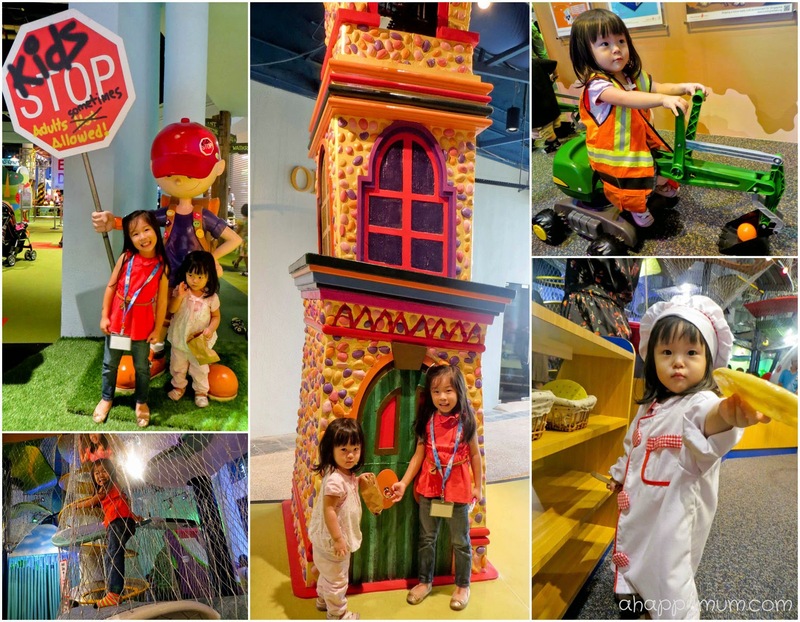 Occupying over 3,000 square meters within the Omni Theatre building, KidsSTOP is an unique edutainment centre that allows children to step into an imaginary world and embark on an exciting journey of discovery. Through hands-on activities and programs in the four thematic zones - Imagine, Experience, Discover, Dream, young children will be engaged and inspired to find out more about the world in a fun, interactive way. The girls learnt to be builders and worked with nuts and bolts, became cashiers in the supermarket, treated a sick baby, drove airplanes, became world class musicians, whipped up delicacies, fed gerbils and touched chicks (real ones! we happened to be there at the perfect timing! ), and even did their first live band performance. Imagination can be so powerful, isn't it? For admission charges and operating hours of KidsSTOP, go here. Well, I guess learning Science can involve a lot of laughter, play and family bonding after all! It's not hard to tell but we'll definitely be back for more fun learning soon! 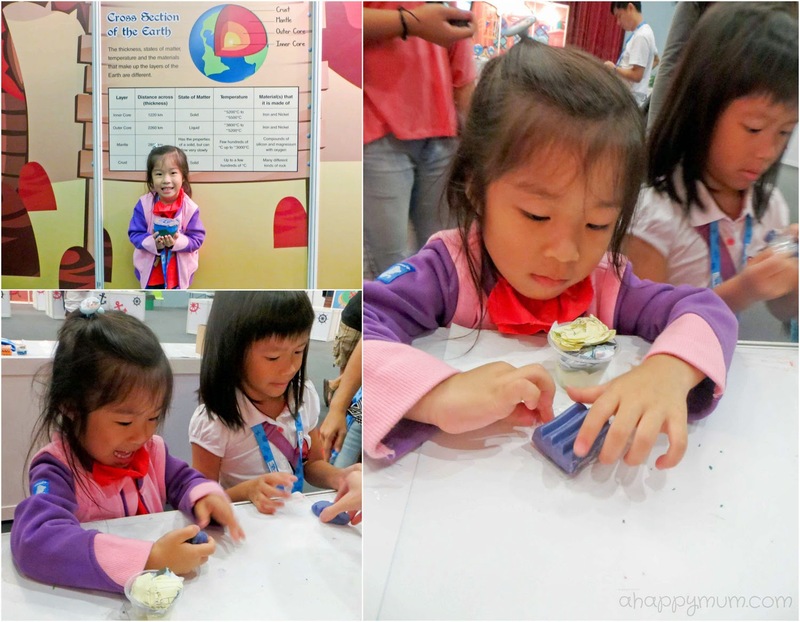 Disclosure: We were invited to a bloggers' event to experience Science Ahoy!, Human Body Experience and KidsSTOP. All opinions are our own.